Bitmach Limited находится в процессе непрерывного роста на международных рынках компьютерных технологий, криптографических алгоритмов и, конечно, Bitcoin горнодобывающей промышленности. Несомненно, наши успехи в высокорентабельные и ультра-современного бизнеса выделяют нашу компанию и сделать наше предложение для инвесторов не только более прибыльные, но и более безопасным. Стратегия развития, которую мы используем, позволяет нам зарабатывать деньги без ущерба для основных финансовых средств. С 2014 года компания Bitmach занимается разработкой алгоритмов для добычи популярных видов криптовалюта, таких как Bitcoin, Litecoin, Dogecoin и т.д. На начальном этапе своей деятельности, компания выбрала путь привлечения инвестиционного капитала и смог реализовать несколько крупных проектов по организации и работающих центров обработки данных с горных ферм в Великобритании. 04.20.16 15:14	Account	Transfer	-200.00	Sent Payment: 200.00 USD to account U11085152 from U4731311. Batch: 129328957. Memo: Shopping Cart Payment. Deposit to Bitmach.net - High payouts User monitorinvestnet. Memo: Sent Payment 300.00 USD to account U11085152. Memo: Shopping Cart Payment. 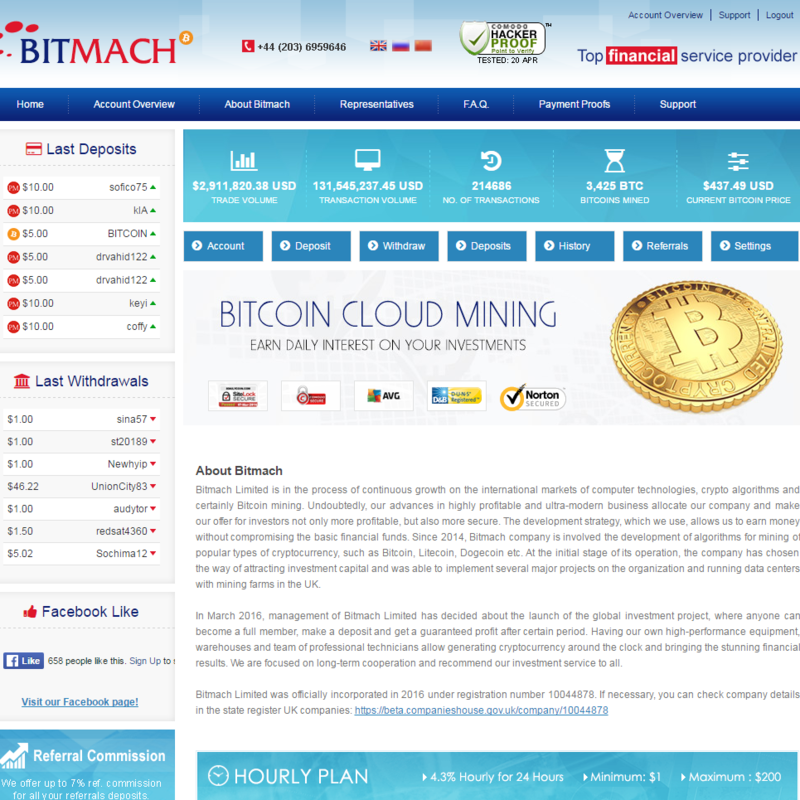 Deposit to Bitmach.net - High payouts User monhyip. 04.21.16 17:53	Account	Receive	+8.75	Received Payment 8.75 USD from account U11783829 to account U4731311. Batch: 129532086. Memo: API Payment. Highest Paying company - BITMACH.Net to Username - monitorinvestnet. 04.20.16 22:57	Account	Receive	+7.5	Received Payment 7.5 USD from account U11783829 to account U4731311. Batch: 129399601. Memo: API Payment. Highest Paying company - BITMACH.Net to Username - monitorinvestnet. 04.22.16 18:12	Account	Receive	+8.00	Received Payment 8.00 USD from account U11783829 to account U4731311. Batch: 129711735. Memo: API Payment. Highest Paying company - BITMACH.Net to Username - monitorinvestnet. 04.22.16 16:14	Account	Receive	+4.5	Received Payment 4.5 USD from account U11783829 to account U4731311. Batch: 129691272. Memo: API Payment. Highest Paying company - BITMACH.Net to Username - monitorinvestnet. 04.22.16 10:02	Account	Receive	+7.00	Received Payment 7.00 USD from account U11783829 to account U4731311. Batch: 129632322. Memo: API Payment. Highest Paying company - BITMACH.Net to Username - monitorinvestnet. 04.23.16 14:52	Account	Receive	+6.4	Received Payment 6.4 USD from account U11783829 to account U4731311. Batch: 129838585. Memo: API Payment. Highest Paying company - BITMACH.Net to Username - monitorinvestnet. 04.22.16 22:17	Account	Receive	+2.5	Received Payment 2.5 USD from account U11783829 to account U4731311. Batch: 129748078. Memo: API Payment. Highest Paying company - BITMACH.Net to Username - monitorinvestnet. 04.24.16 17:57	Account	Receive	+4.75	Received Payment 4.75 USD from account U11783829 to account U4731311. Batch: 129991591. Memo: API Payment. Highest Paying company - BITMACH.Net to Username - monitorinvestnet. 04.24.16 11:13	Account	Receive	+9.5	Received Payment 9.5 USD from account U11783829 to account U4731311. Batch: 129942919. Memo: API Payment. Highest Paying company - BITMACH.Net to Username - monitorinvestnet. 04.25.16 17:49	Account	Receive	+15.7	Received Payment 15.7 USD from account U11783829 to account U4731311. Batch: 130152318. Memo: API Payment. Highest Paying company - BITMACH.Net to Username - monitorinvestnet. 04.25.16 10:57	Account	Receive	+2.5	Received Payment 2.5 USD from account U11783829 to account U4731311. Batch: 130086329. Memo: API Payment. Highest Paying company - BITMACH.Net to Username - monitorinvestnet. 04.24.16 22:07	Account	Receive	+2.00	Received Payment 2.00 USD from account U11783829 to account U4731311. Batch: 130021829. Memo: API Payment. Highest Paying company - BITMACH.Net to Username - monitorinvestnet. 04.26.16 18:27	Account	Receive	+8.5	Received Payment 8.5 USD from account U11783829 to account U4731311. Batch: 130326521. Memo: API Payment. Highest Paying company - BITMACH.Net to Username - monitorinvestnet. 04.26.16 11:00	Account	Receive	+5.5	Received Payment 5.5 USD from account U11783829 to account U4731311. Batch: 130256474. Memo: API Payment. Highest Paying company - BITMACH.Net to Username - monitorinvestnet.